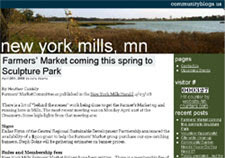 Members of New York Mills' Horizons Leadership program have launched a community blog, with area residents as the bloggers! Recent topics include community garden news, starting a farmers' market, citywide clean-up day, meeting reports and dodgeball tournament results. The blog also includes upcoming events.